For unparalleled service and sparkling clean windows, contact Schoeben's Window Cleaning Service. To learn more about any of our professional window cleaning capabilities or to arrange a free estimate for your next window-cleaning job, please give us a call today! 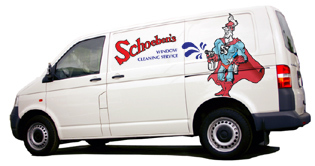 Schoebens Window Cleaning has been in business for over 30 years serving the Twin Cities metro and Brainerd Lakes areas. We specialize in residential interior/exterior window cleaning and have an A+ Better Business Bureau rating. Schoebens delivers solid, quality services and always goes the extra mile. Professional, timeliness, speed to completion, and excellent communication are the most common remarks satisfied customers share. Schoebens can give you back your view with sparkling clean windows. We also offer many services to compliment your newly cleaned windows. Schoebens Window Cleaning has the skill, the experience and the references that make us the clear choice for your window cleaning needs.